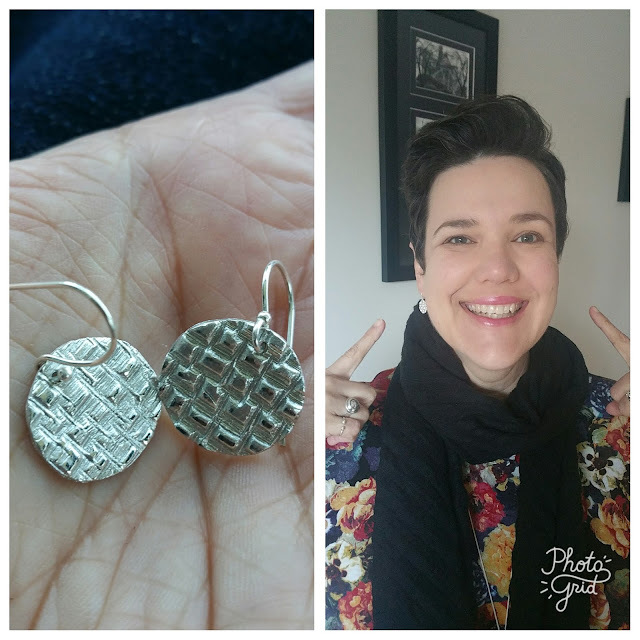 I attended a really great workshop on the weekend at the Sydney Jewellery School (which recently moved from Rosebery to Parramatta - how lucky for me)! 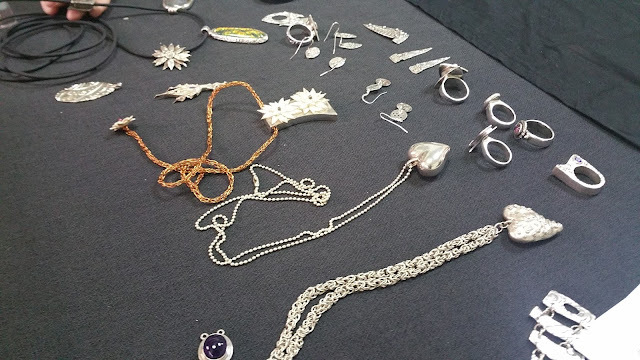 The class was all about making silver jewellery with Precious Metal Clay (PMC). I first became aware of PMC through Marialla Walker's Instagram (here and here). There is seriously no craft this lady has not tried - inspirational! 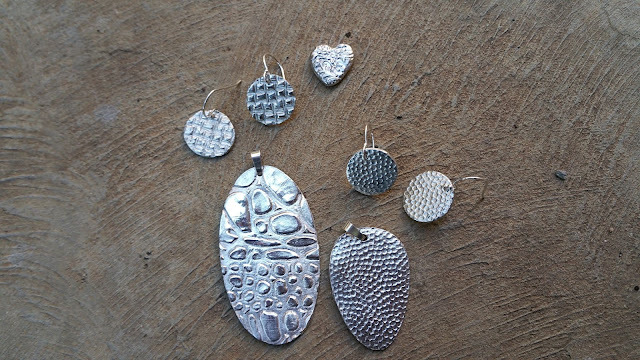 Wikipedia tells us that "Metal clay is a crafting medium consisting of very small particles of metal such as silver...mixed with an organic binder and water for use in making jewelry, beads and small sculptures. 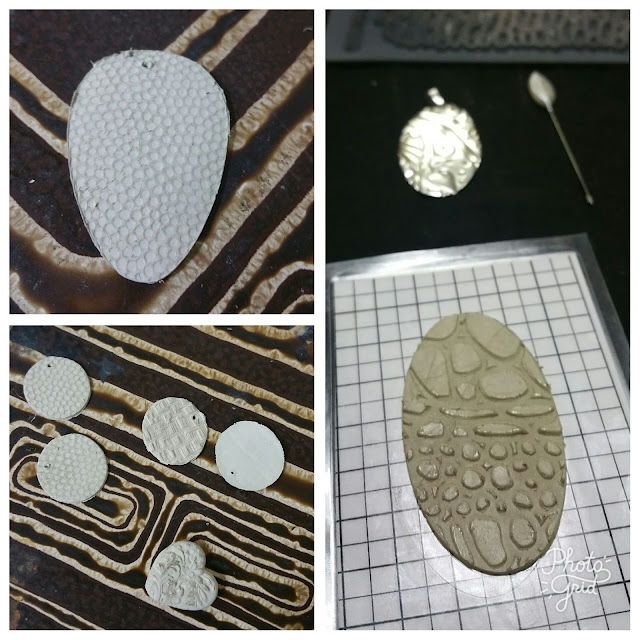 Originating in Japan in 1990, metal clay can be shaped just like any soft clay, by hand or using molds. After drying, the clay can be fired in a variety of ways such as in a kiln, with a handheld gas torch, or on a gas stove, depending on the type of clay and the metal in it. The binder burns away, leaving the pure sintered metal." 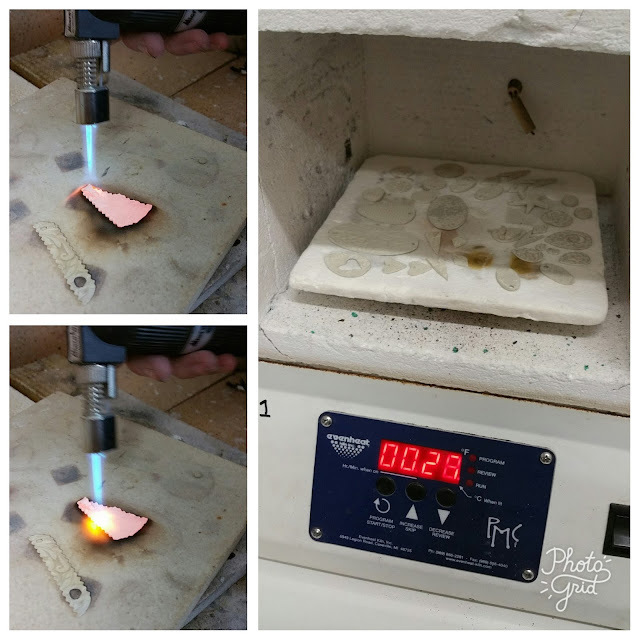 I was attracted to this class as it is actually something you can do at home if you want -- no need for a kiln, just a creme brulee torch and you're off! I'm already dabbling in polymer clay at home so this seemed like a good "next step". Our teacher Donna was great - very very patient! And I think she brought with her every gadget and tool in her workshop which we were free to use. 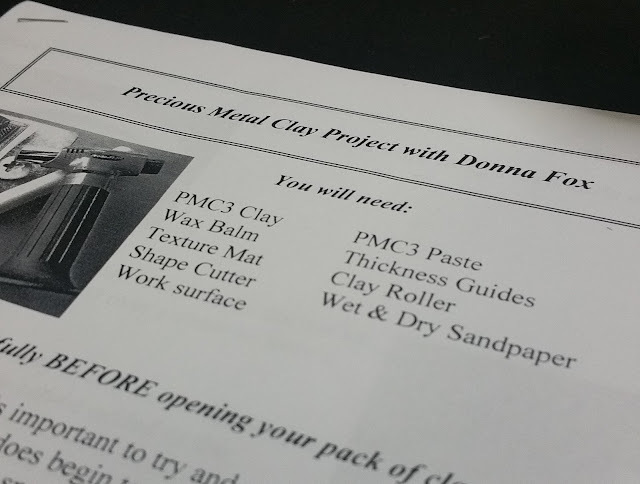 The first hour of the class was spent being shown various techniques in working with the clay (PMC3) and then we were encouraged to plan out what we wanted to do before opening up the clay and letting it go hard (this stuff is not cheap at ~$50 for 16g so it was very good advice). Sixteen grams of clay is not a lot and in way I'm glad as I kept my wishlist small and simple and went for two pendants and two sets of earrings. I also had enough for a little heart (made from a mould) that I have given to Dave...he has no idea what to do with, but I can't wear it so I don't want it! I do wish I had made the shapes of the earrings different from each other as they look a bit "same same" but you live and learn! This is the clay, once it has been rolled out and had a textured surface applied by pushing it into a rubber or metal mat. Shapes are cut out using a pin from a shaped stencil - easy! The school has a kiln so most of our pieces went into the kiln for firing (took 30 minutes to do this). As you can also fire PMC3 using a kitchen blow touch Donna showed us how to do this too. I wasn't going to embark on this as a hobby at home but I'm kind of running out of space to put all my crafting stuff...but I feel like the seed has been sewn and it might just happen. I didn't have a go at using the blow torch but I kind of wish I had now. Once the clay comes out of the kiln it has become 99.9% pure silver though it still looks like white clay. Once you've gone at it with a wire brush the silver surface is revealed. In order to get a good shine on your piece you need to go at it with a bevel (? )...which I kind of did, but to be honest it all looked shiny enough to me. Here I am wearing one pair of my new earrings at work - LOVE them! The Sydney Jewellery School has loads of great classes - I can see myself enrolling in more classes here.